The idea that I would be a farmer never crossed my mind. I, after all, am a low level executive manager at a learning science company. I spend time in virtual meetings, talking about ROI , market research and other things that are very boring for most people (myself included) to think about. I am a cog - a doer of spreadsheets - not a farmer. It was during a moment of clarity - or utter exhaustion form having a 4 week old baby - that I decided to reach out to Greenwave to talk about what it would take to farm kelp. Greenwave is a non-profit that put kelp farming on the map, locally at least. They are dedicated to restoring ecosystems, mitigating climate change, and building a blue-green economy. I wanted in. Jay and I had just purchased a marina and we were planning on moving in after many months of renovations. The marina was the first step in realizing our dream of living a simpler life. We wanted to own a business and work for ourselves. We wanted to be connected with the planet and raise the kids in a way that shows them how cool the world is - specifically the ocean and river that would be a few feet away from our new front door. The marina was step one. It provide meaningful work for Jay, it provided a revenue stream dependent on the water, and most importantly, it let us mess about in boats. It left me, however, with two feet in the corporate world, and this was not acceptable. In an attempt to think outside the box and find a venture that I could be passionate about I thought of the sea - specifically kelp - and took to google. After reading a few articles and research papers, I sent an email to Greenwave to learn if Jay and I were located in a space that could support kelp. I wanted to see if this was an option. It was less than two days after that email that I got a response from the co-founder of the organization. Emily called us to share some of the basics of kelp farming. 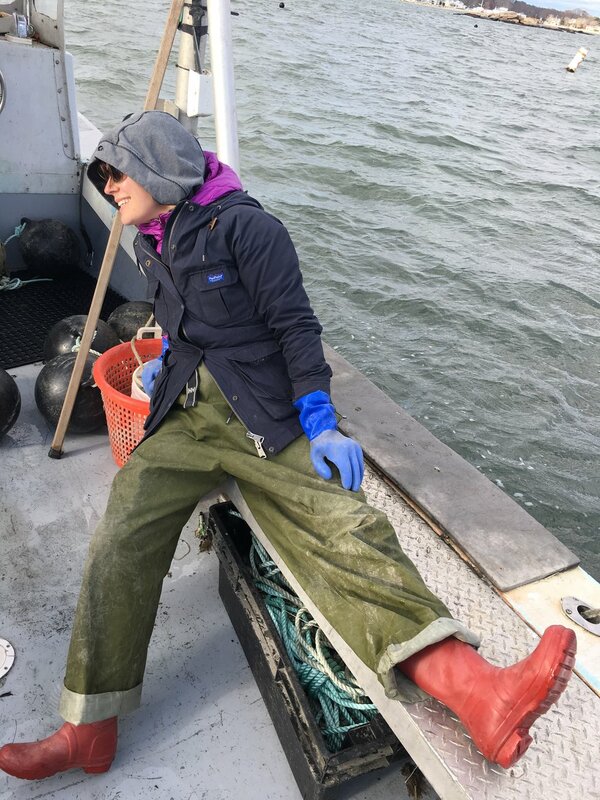 She went over the general rules of thumb for farming: the depth we would need for the farm, the pains of the permitting process, the people with whom we should speak about what it really feels like to go through permitting, the market for kelp, and most important - the support that Greenwave could offer. She hooked us on the idea so thoroughly that we began the process towards establishing a farm that very day. Pre-Screening for Aquaculture Application: this was where we find the site and get it approved by all the peoples...all of them had to say yes. Kelp sites require specific depth, water flow, sunlight, must be away from eelgrass beds, and more. The site is hard to nail down....and even when you do ger approval, you wont know if the kelp will grow for a year. Structures Dredging and Fill permit (this is for CT). This includes a public notice portion which allows people to voice any issues with your site location. We started in September 2016 and as of today, we are working on the last permit. The process forces you you to really think about your site and consider how it will impact everything in the area: marine life, recreational boaters, other aqua-farmers, the water quality and other abiotic stuff, and your farm. It was a good process and I am somewhat relieved that there are check points to help people consider these things when setting up a farm. I feel prepared. Take notice, would-be-farmers, the actual farming will be a ways down the road. The beginning is all about the plan.